L to R: Debbie Eller, Communities in Schools; Kenvian Ferguson, Teacher Treasures; Liza Plaster and Bill Hirsch, Chapel of Rest Preservation Society; Chassidy Triplett, Koinonia; David Eggers, Vice President, Blue Ridge Board of Directors; Carl Wagner, Caldwell County Lions Activities Association; Jeff Joines, President, Blue Ridge Board of Directors; Susan Gray, Helping Hands Clinic; Kelly Melton, Blue Ridge board member; AmBrea Williams, Caldwell Opportunities Inc.; Tyler Reese, Caldwell district manager; Bob Laws, The Caldwell Halfway House; April Austin, Caldwell Senior Center. Caldwell County citizens will benefit from grants worth $30,615 awarded recently to local helping agencies from the Blue Ridge Energy Members Foundation for the most recent grant cycle. Since its inception, the Foundation has awarded more than $1.1 million in community grants and more than $3.3 million in total assistance for helping members and families stay warm in the winter with heating bill assistance. The grants are examples of why the cooperative established the Members Foundation in 2007 to support the work of community organizations providing services that improve the quality of life for the cooperative’s members. Projects in the areas of health, wellness, education, youth, and economic and community development are the Foundation’s priorities for support. The Caldwell Halfway House, $5,000 to help fund ongoing interior renovations. During 2018, the Foundation also provided crisis funding assistance to more than 1,200 Blue Ridge Energy members in need of emergency help to pay their electric bills. While crisis assistance is funded by the Foundation, local helping agencies evaluate needs and determine who qualifies for assistance. 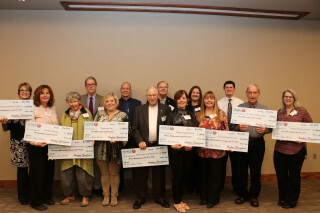 Funding for Foundation grants and crisis assistance comes from members participating in Blue Ridge Energy’s Operation Round Up® and Operation Round Up Plus® programs as well as an annual contribution from the profits of Blue Ridge Energy, LLC, the cooperative’s heating fuels subsidiary. Over 28,000 members are either rounding up their monthly electric bill with Operation Round Up or adding a dollar or more with Operation Round Up Plus. Anyone with questions about the Foundation, or agencies interested in applying for grants, may contact Grey Scheer, director of community relations, at gscheer@blueridgeenergy.com.